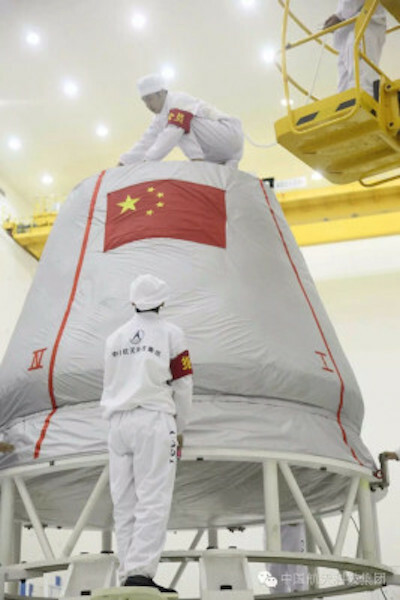 China’s new-generation manned spacecraft for both LEO and deep space missions. Development began in 2013 and expected to fly in the 2020s. Type: Human capsule. Crew size: 4 to 6. Agency: CMSA. Primary contractor: CAST. Status: Development. Launch vehicle: CZ-7, CZ-5B. Launch complex: Wenchang-LC101/201. Orbit: LEO/BEO. Mass (gross): 14 t/20 t.
China Academy of Space Technology (CAST) has been developing a new-generation multi-purpose crew vehicle for future manned spaceflight missions to LEO and beyond. The not-yet-named spacecraft will be capable of carrying capable of carrying 2 to 6 crew members to Earth orbit, the Moon, Lagrange Points, Near Earth Asteroids, and Mars. Two versions of the spacecraft based on the same crew module but with different propulsion systems have been proposed: a 14-tonne mass version for LEO and deep space missions, and a 20-tonne mass version for manned lunar landing. According to a CAST research paper titled “Concept Definition of New-Generation Multi-Purpose Manned Spacecraft, which was published in the January 2014 issue (Vol.35) of Chinese Journal of Aeronautics, China’s future manned spaceflight will include five typical types of missions: crew ferry flights to and from the space station on LEO, as well as exploration missions to Lagrange Points of the Earth-Lunar System, Lunar surface, Near Earth Asteroids, and Mars. 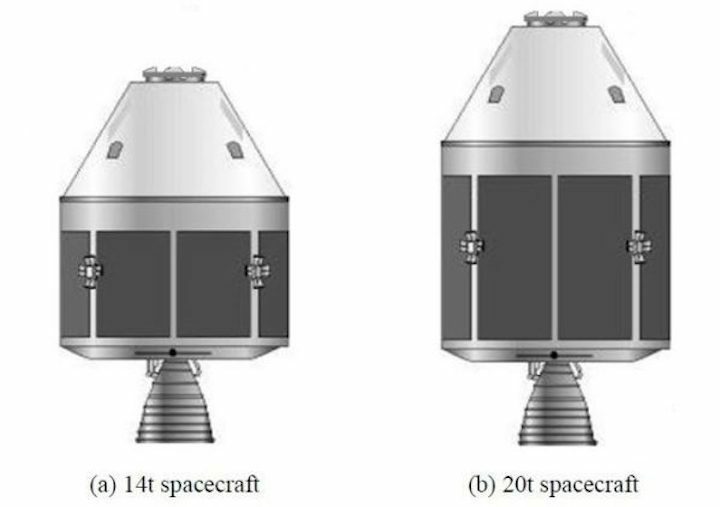 The future Chinese crew vehicle will therefore need to be able to support all of these missions with a single baseline design, using a modular architecture to achieve high degree of flexibility, expandability, and reusability. The multi-purpose crew vehicle will be launched atop the man-rated CZ-7 or CZ-5B launcher. For lunar landing and deep space missions, the spacecraft will need to carry up to 4 crew members. For ferry flights to the LEO space station, the spacecraft is required to carry up to 6. Based on the concepts of future lunar landing and deep space missions, the spacecraft is required to be capable of operating independently on orbit for at least 21 days, or 2 years if docked with the space station. Two types of service modules can be used by the spacecraft to meet different mission requirements. A two-module design, with a large habitable crew module at the front, and an uninhabitable cylindrical-shaped aft service module. 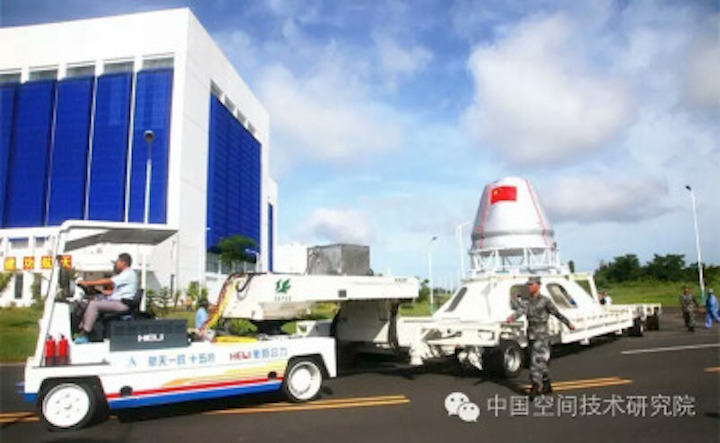 The crew vehicle is twice the size of the Shenzhou re-entry module, capable of accommodating up to six astronauts. A docking port and associated docking sensors are fitted to the front-end of the crew module. The spacecraft can be fitted with two different service modules, with different propulsion systems and propellant capacities. 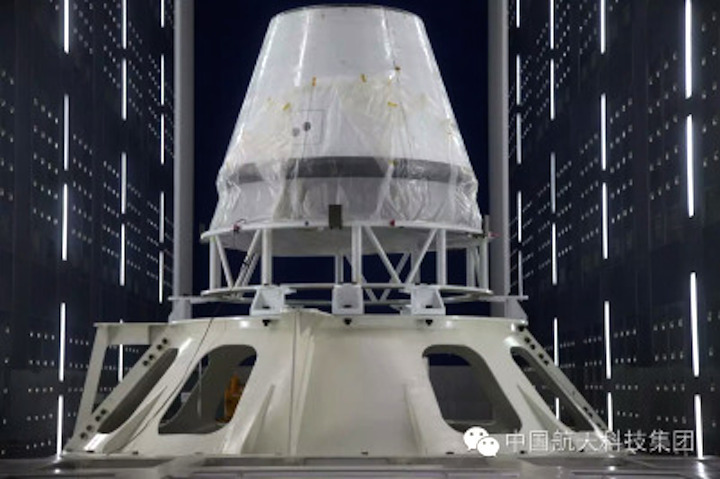 Instead of the bell-shaped re-entry module currently used by the Shenzhou spacecraft, the next-generation crew vehicle will have a blunt cone-shaped crew module, similar to that of the Boeing CST-100 or Orion CEV. The crew module will feature a reusable airframe built from lightweight alloys, covered by expandable heat-resistant protective layers and shielding. An integrated launch escape system, with solid rocket launch abort motors fitted on the service module to separate the entire spacecraft vehicle from the launch vehicle in case of emergency. The thermal shield of the crew module will be made from light weight ablator material, such as Phenolic Impregnated Carbon Ablator (PICA). The multi-purpose crew vehicle will be recovered at sea, at a location near the Earth equator off Chinese coast, while the land recovery capability is retained as backup. Multiple parachutes and airbags are used for a soft landing at sea or in land. Capability of continuous communications throughout the atmospheric re-entry. Highly integrated avionics and spacecraft self-diagnosis system. Development of the new-generation crew vehicle possibly began around 2013 at CAST. In November 2015, 508 Institute of CAST completed an airdrop test using a set of three parachutes, each with 1,200 square metres of surface area. The test may be associated with the multi-purpose crew vehicle development. During the maiden flight of the CZ-7 launch vehicle on in June 2016, a subscale re-entry capsule of the multi-purpose crew vehicle was launched among other payloads. 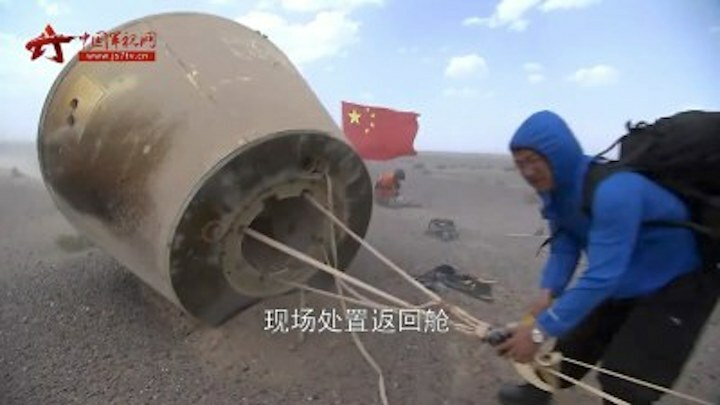 The capsule, which was successfully recovered after 19 hours of orbital flight, was 2.3 m in length and 2.6 m in diameter, with a total mass of 2,600 to 2,800 kg. Onboard systems included batteries, propulsions, a guidance & navigation system, heat shield, parachutes, and a communications system capable of transmitting through the plasma occurring during the hypersonic atmospheric re-entry sequence. Sensors were fitted on the capsule to collect aerodynamic and heating data during the atmospheric re-entry. 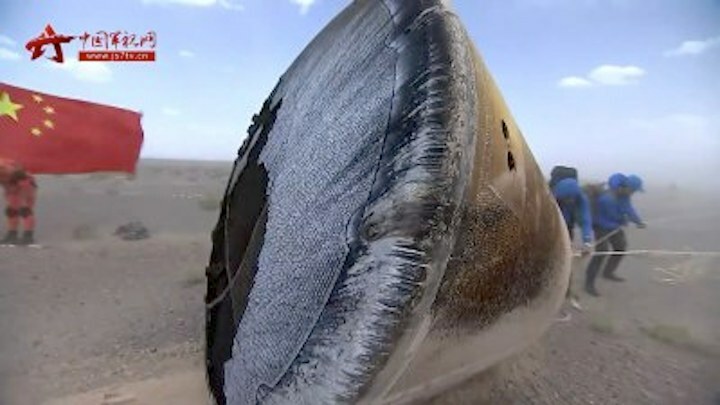 The capsule also featured a reusable airframe built from lightweight alloys, covered by expandable heat-resistant protective layers and shielding. A second, possibly larger but still not full-sized re-entry capsule of the multi-purpose crew vehicle will be launched in the CZ-5B’s maiden flight in 2017.